Home Android and iOS Game Apps Pokemon GO Tips and Guides Pokemon GO: What Are IVs?, Do They Carry Over After Evolution? Pokemon GO: What Are IVs?, Do They Carry Over After Evolution? Here's a FAQ guide for IVs (Individual Values) and how they affect your gameplay experience. - Every Pokemon has 3 base stats that are hidden: ATTACK, DEFENSE, and STAMINA. 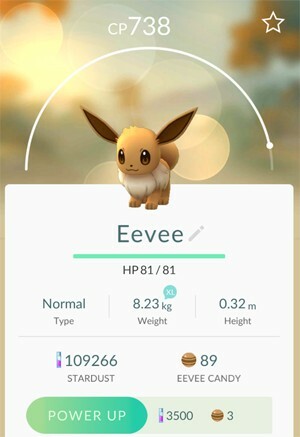 - Now, all Eevee will get the same base stats, but there is another hidden stat that will give a particular Eevee an edge over the others. - Yup, this is where things gets complicated and the game creators did it to give some variance to all Pokemon under the same specie. "Not all Pokemon are born the same! ", as they say. - IVs aren't new too, they also exist on other Pokemon Games. When Do Pokemon Get Their IVs? - Each Pokemon is randomly given a 0-15 stat bonus to all 3 Base Stats once they spawn from the wild, or after hatching them from an Egg. - These IVs are permanent, it can't be increased, and will carry over to their final evolution phase. - Let's take Eevee and evolve it to 2 Vaporeons for example. 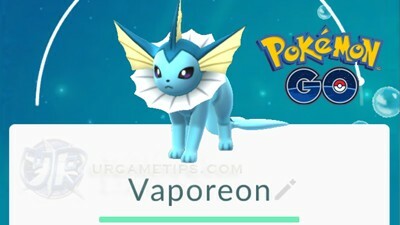 - Once you max their CPs with Power-Ups, the perfect Vaporeon will probably get a higher CP rating and MAX CP, regardless of their original CPs before maxing out. - One thing to consider here is the overall cost to upgrade, is it better to increase my Trainer Lvl before getting one? or is it ok to evolve and upgrade my 90% IV Pokemon but with way lesser CP? - Here's a tip: If that Pokemon is too common around your area, then it would be best to increase your Trainer Lvl to at least Lvl 20 first before finding one, this way you can get a higher CP Pokemon with similar or higher IVs and save more resources. - If it's a pretty rare one, it could be a good investment in the long run but it would require more resources. It is actually your choice, and how useful that Pokemon to you overall. If you are unsure, just keep it for now, or evolve it to it's final form to check it's move set. - Also consider, how long will you be able to get another one with high IVs. - The estimated percentage of a 0/0/0 vs a 15/15/15 is up to 10% difference per base stat. Yup, the impact of IVs aren't really big for Pokemon GO, but it would still be a considerable factor for determining close fights or for future in-game features/updates for battle mechanics. - The best part is, you can now really choose the best Pokemon to invest your hard earned Candies and Stardusts. One good example is Magikarp, that requires 400 Candies to evolve. - Find a Magikarp with at least 85% IVs, but if you can find 90%+ or 100% Perfect IVs, then that's even better. - Note: For a rarer Pokemon, you can also settle for 80% IVs and above if you like, but if you just want your common Pokemon to evolve, 75%+ IVs are acceptable, especially when you just want to create an army of decent Pokemon for Gym Battles while waiting. How To Determine My Pokemon IVs? - Unfortunately, IVs are hidden and it's really hard to determine just by looking at your Pokemon's available info, so Trainers use Spreadsheets and Calculators to estimate what their Pokemon IVs are, using known formulas or equations. - If you know how to set up proxies to intercept server data in order to determine exactly what your Pokemon's IVs are, then that's the best choice. However, this will also mean that you will be breaking the game's ToS hehe. - Calculators require that you exactly input the Name, CP, HP, and Stardust Requirement of your Pokemon. You will receive a range of possible percentages, because determining your Pokemon's Lvl through Stardust Requirement alone isn't 100% accurate. - Optional: To narrow this down, you might need to Power-Up your Pokemon once or until the Stardust Requirement increases, then input the new stats. Since this will require you to spend your precious Stardust, it might be better to use it on a Pokemon with an estimated range of 75%~90%, for example, this way at least you know that it will not go down 75%. - Note: Evolving a Pokemon is NOT considered as "Powered-Up". - Only focus on Pokemon that you would like to use, to minimize the number of entries you need to check. - To easily track your Pokemon and their IVs, you can rename them and use it as guide. - Select the ★ (upper right corner) to include them to your favorite list, and keep them safe. How Rare are 90% and 100% Perfect IVs? - Numbers 0-15 gives 16 total = 16*16*16 = 4096 possible combinations. - So, roughly around 1.2% chance, even lower for 100% perfect IVs like around 0.5% chance. - So far the best source for high IVs is from Eggs > then the Wild > Pokemon Nests. - The only way is to catch a lot of Eevees for example, then compare their stats with the others. - Example #1: 2 Pokemon with identical 700 CPs or close, the one with higher HP will probably have a higher Stamina IV for sure. - Example #2: 2 Pokemon with identical 700 CPs or close, the other has 3000 Stardust Requirement, while the other one has 2500. It's better to choose the Pokemon with 2500 Stardust Requirement because it has higher IVs for sure. How high? that's the problem, and calculators are the only way to find them out at the moment. - Note: Weight and Height of the Pokemon doesn't affect any IVs. Prioritize Move Sets Over IVs! - Since Move Sets are your main source of DPS, it is recommended that you evolve first your high IV Pokemon to their final form to check it's Move Set. Yes it's a gamble, so you might need multiple Pokemon with high IVs to evolve until you get the best Move Set for your Pokemon. - I would still suggest keeping those 100% Perfect Pokemon with bad Move Set though, for future use, in-case they implement a feature where you can change your Pokemon's moves. Conclusion: Is It Worth The Trouble? - Considering the attackers huge advantage in gyms along with the battle mechanics at the moment...the gap between stats, "many" vs 1 perfect, the total cost, and how long will you wait are really where things gets debatable but overall, it's a personal choice. - If you are a casual Trainer that can hold gyms without problem, or just enjoys the game collecting Pokemon, then IVs can be ignored, because it will make your game more complicated. Just keep pushing your Pokemon CPs by following the "How To Spot A Pokemon With High IVs" section above, plus it is also rare to get 0/0/0 IVs anyways. - Pokemon GO: Quick Walkthrough Guide - Lvl Up Fast and Catch Up!